Varanasi also known as Benares, Banaras , or Kashi , is a city on the banks of the Ganges in the Uttar Pradesh state of North India, 320 kilometres (200 mi) south-east of the state capital, Lucknow, and 121 kilometres (75 mi) east of Allahabad. The spiritual capital of India, it is the holiest of the seven sacred cities in Hinduism and Jainism, and played an important role in the development of Buddhism. Varanasi lies along National Highway 2, which connects it to Kolkata, Kanpur, Agra, and Delhi, and is served by Varanasi Junction and Lal Bahadur Shastri International Airport. Varanasi grew as an important industrial centre, famous for its muslin and silk fabrics, perfumes, ivory works, and sculpture. Buddha is believed to have founded Buddhism here around 528 BC when he gave his first sermon, "The Setting in Motion of the Wheel of Dharma", at nearby Sarnath. The city's religious importance continued to grow in the 8th century, when Adi Shankara established the worship of Shiva as an official sect of Varanasi. Despite the Muslim rule, Varanasi remained the centre of activity for Hindu intellectuals and theologians during the Middle Ages, which further contributed to its reputation as a cultural centre of religion and education. Tulsidas wrote his epic poem on Rama's life called Ram Charit Manas in Varanasi. Silk weaving, carpets and crafts and tourism employ a significant number of the local population, as do the Diesel Locomotive Works and Bharat Heavy Electricals Limited. Silk weaving is the dominant industry in Varanasi. Muslims are the influential community in this industry with nearly half a million of them working as weavers, dyers, sari finishers, and salespersons. Weaving is typically done within the household, and most weavers are Momin Ansari Muslims. Varanasi is known throughout India for its production of very fine silk and Banarasi saris, brocades with gold and silver thread work, which are often used for weddings and special occasions. The production of silk often uses bonded child labour, though perhaps not at a higher rate than elsewhere in India.The silk weaving industry has recently been threatened by the rise of power looms and computer-generated designs and by competition from Chinese silk imports. In the metal manufacturing sector, Diesel Locomotive Works is a major employer. Bharat Heavy Electricals Limited, a large power equipment manufacturer, also operates a heavy equipment maintenance plant. Other major commodities manufactured and traded in Varanasi include hand-knotted Mirzapur carpets, rugs, dhurries, brassware, copperware, wooden and clay toys, handicrafts, gold jewellery, and musical instruments. Important agricultural products include betel leaves (for paan), langra mangoes and khoa (solidified milk). Varanasi is well-connected by air, rail and road. 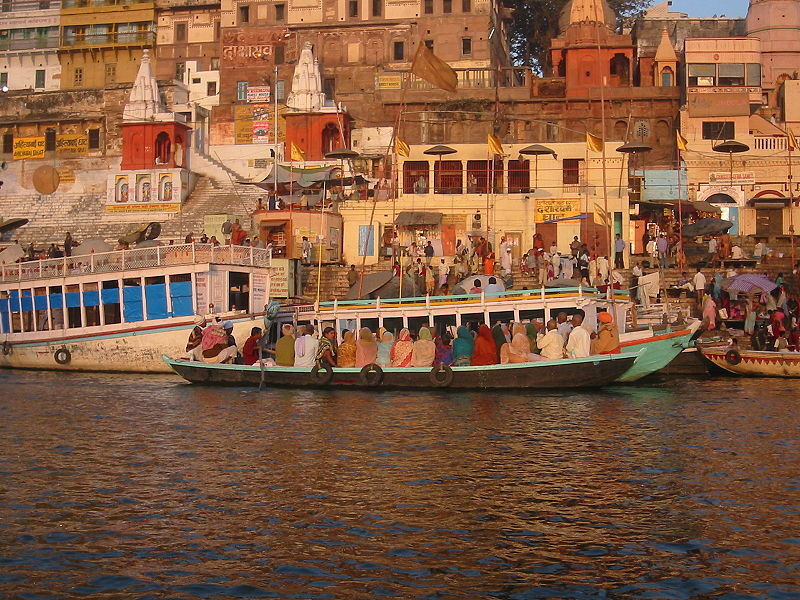 One of the major factors in Varanasi's is its access to all parts of the country. Within the city mobility is provided by taxis, rickshaws, cycle rickshaws and three wheelers but with certain restrictions in the old town area of the city. Varanasi is served by Lal Bahadur Shastri International Airport, which is approximately 26 km (16 mi) from the city centre in Babatpur. The airport inaugurated a new terminal in 2010, and it was granted international airport status on 4 October 2012. 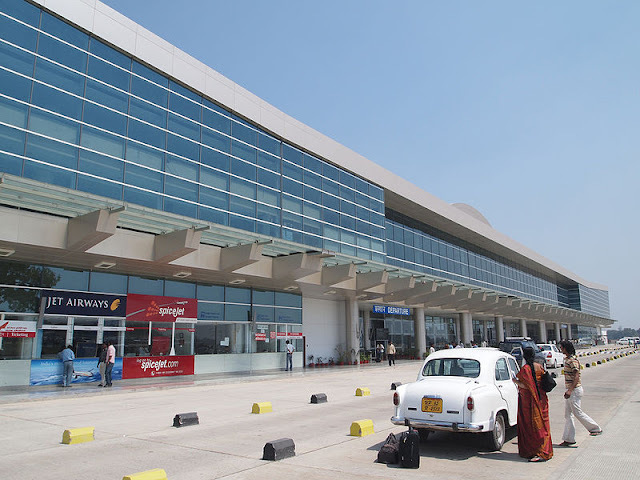 Air India, Buddha Air, Jet Airways, Jet Konnect, IndiGo, and SpiceJet operate flights from Varanasi to Delhi, Gaya, Kathmandu, Khajuraho, Sharjah, Lucknow, Mumbai, Hyderabad, Bangalore, and Kolkata. Over 330,000 passengers pass through the airport each year. Varanasi Junction, commonly known as Varanasi Cant Railway Station, is the city's largest train station. More than 360,000 passengers and 240 trains pass through each day. Some of the important express trains operating from the Varanasi Junction railway station are: the Udhna Varanasi Express that runs between Udhna (Surat) junction and Varanasi, a distance of 1,398 kilometres (869 mi); the Kashi Vishwanath Express that runs between Varanasi and New Delhi Railway Station; the Kanpur Varanasi InterCity express, also called Varuna express, which runs over a distance of 355 kilometres (221 mi) and connects with Lucknow (the capital city of Uttar Pradesh) and Kanpur; and the Sabarmati Express which runs between Varanasi and Ahmedabad. No Comment to " Varanasi - Industrial Development Post Independnce "